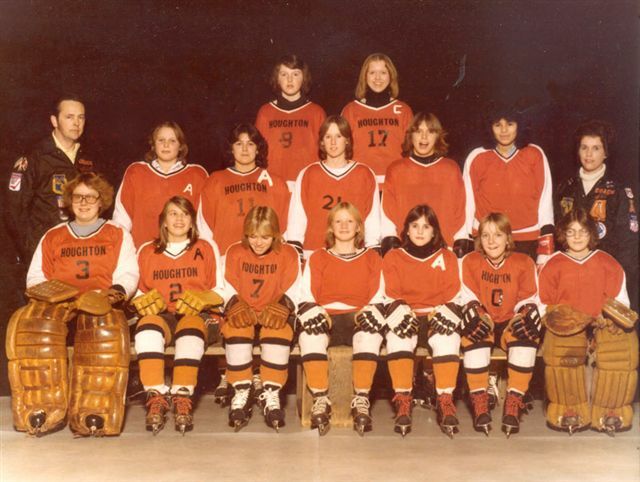 1973 was the inaugural year for the local women's Houghton Angles Hockey Team. 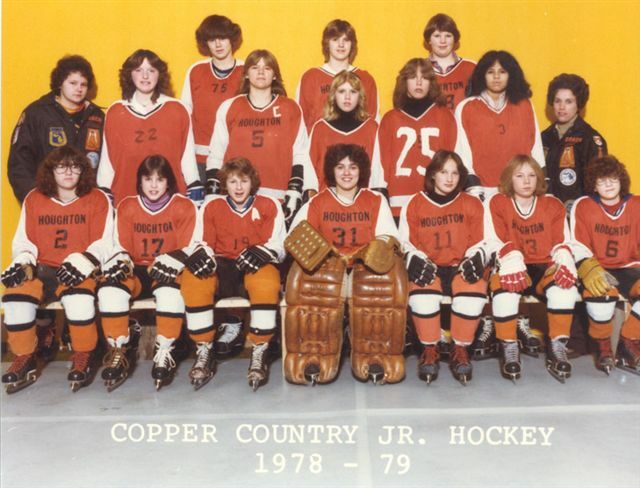 Their first coach was .... Their home ice was the Dee Stadium. 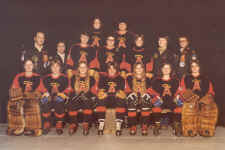 The team consisted of girls age 12 to18 from Houghton, Hancock, Chassell, South Range, Dollar Bay and surrounding areas in Upper Michigan. They played for ? seasons 1973-?? 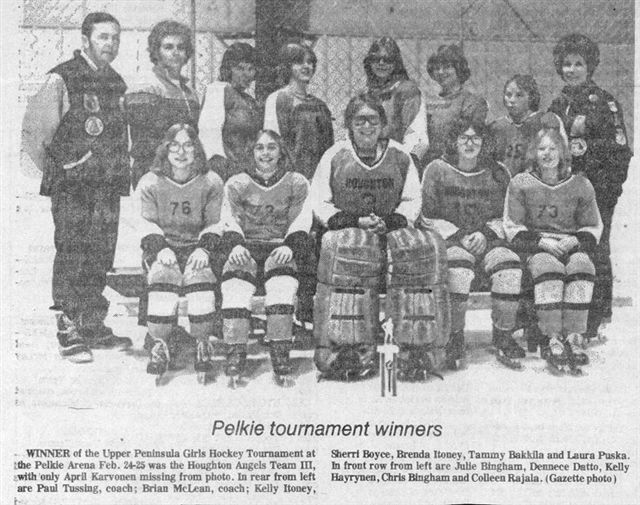 against local women's teams from Calumet, Pelkie and L'Anse as well as teams from lower Michigan and Canada. 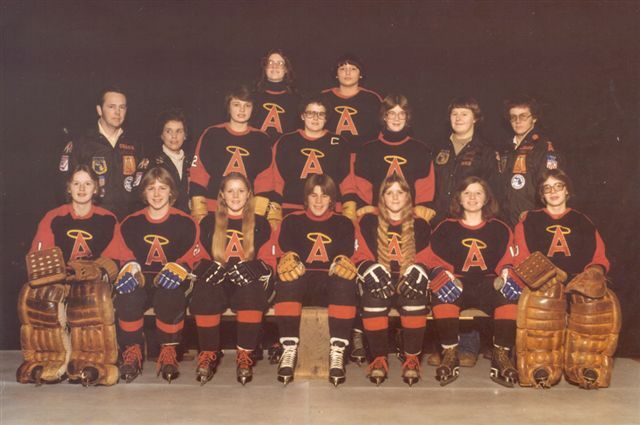 Houghton Angels took home the first trophy in 1977 in the Michigan Amateur Hockey Association - State Competition, Michigan 'Teen B' Division - State 'Runner Up'. 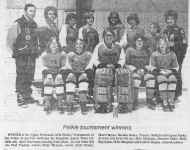 In 1977 they also took Runner Up in the McDonalds of Canada - Sudberry, Ontario - Tournament 'Runner -Ups'; they took Runner Up in the State Championship game, loosing the game in the last second. Lori (Wakeham) Geshel from South Range, who played on the team from 1976-80, relates that "We played against girls teams from Calumet and Pelkie, lower Michigan and Canada. Because Pelkie used pond water to flood, we were able to see frozen minnows in the ice at the Pelkie rink. We also traveled downstate to lower Michigan and to Canada." 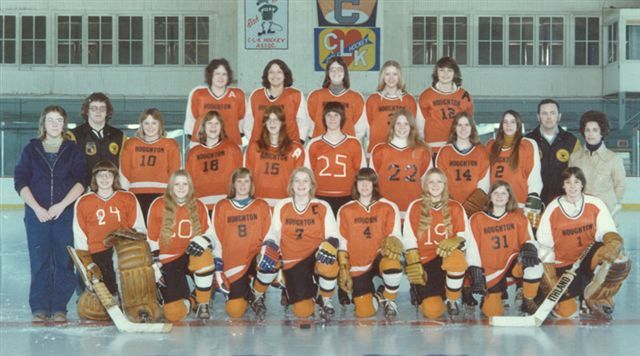 Sue Johnson from Houghton?, a member of the team for 7 seasons, relates: "There was an old standing joke in Allen Park, Michigan, among other Girl Hockey teams, when the Houghton Angels come to town, make sure your blades are sharp - with the comment by a few parents, 'the Houghton Angles' can't be 'bridesmaids' forever! Unfortunately, that is where we ended our careers. As our final attempt at the State Championship, sent us home one more time defeated - loosing it the last second of the game." please contact the webmaster if you have these team pictures. 1975-76? House or Travel team? 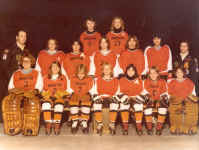 please contact the webmaster if you know any of the names of these players! Back Row L to R: Beth Rodeheffer, Joyce Puuri. 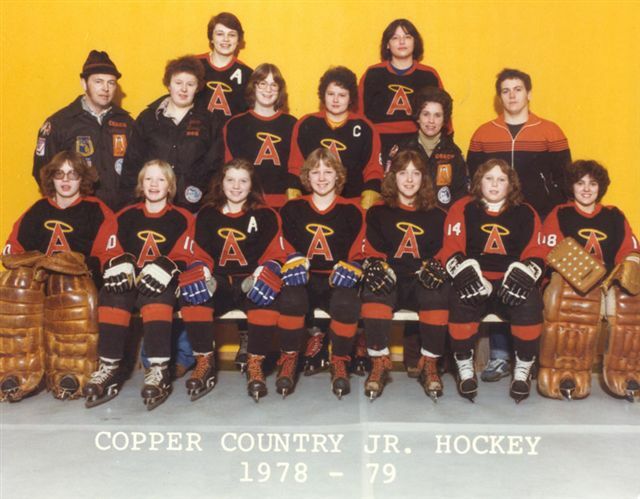 Back Row L to R: Coach Paul Tussing, Coach Brian McLean, Kelly Itoney, Sherri Boyce, Brenda Itoney, Tammy Bakkila, Laura Puska. Sitting: Julie Bingham, Dennece Datto, Kelly Hayrynen, Chris Bingham, Colleen Rajala. 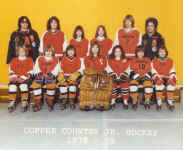 Back Row L to R: Patty Markham, Sue Manderfield. 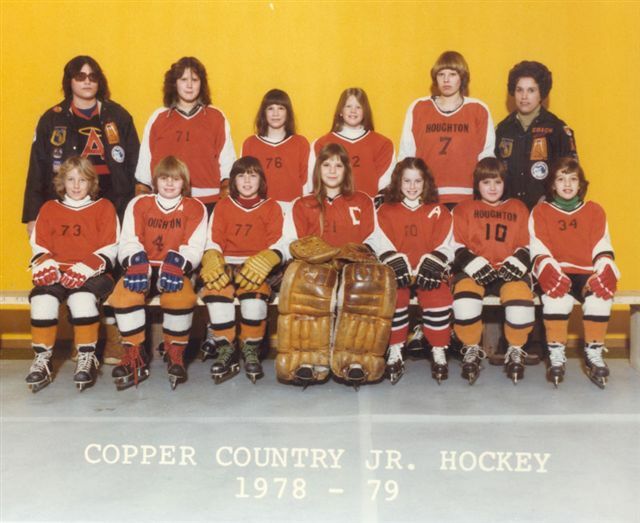 Middle: Coach Paul Tussing, Coach Pat Tussing, Cherri Daato, Cheryl Vencato, Jane Markham, Asst Mgr Sandy Vencato, Coach Brian McLean. Sitting Lt to Rt: Terry Bussiere, Lori Wakeham, Wendy Paulson, Dorothy Daavettila, Carrie Paulson, Pauline Miller, Tracy Hagwell. missing from photo: Lauri Engman, Cheryl Ruohonen. please contact the webmaster if you have a copy of this team picture! Ann Ralinovski, 4, 5, Coach Pat Tussing. Seated L-R: Janelle Juntonen, 2, 3, Ruth Otto, 5, 6, 7. 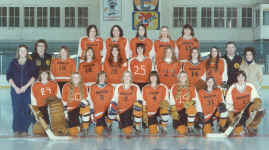 Top Row L to R: Kelly Itoney, Sherry Boyce, Tammy Bykkonen. 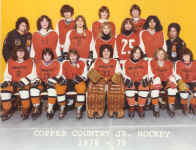 2nd row L to R: Cheryl (Vince) Vencato -Asst. Beth Rodeheffer, Brenda Itoney, Debbie Erickson, Lisa Miller, Laurie Stevens, Pat Tussing -Coach. Front Row L-R: Chris (Bingham) Abramson, Penny Tussing, Jodi Hannon, Lisa Katalin, April Karvonen, Laura Puska, Kitty Gerich. Back Row L to R: Cherri Datto, Sue Manderfield. 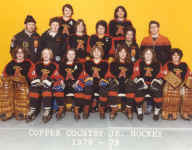 Middle: Coach Paul Tussing, Asst. Mgr. Sandy Vencato, Jane Markham, Cheryl (Vince) Vencato, Coach Pat Tussing, Coach Brian McLean.